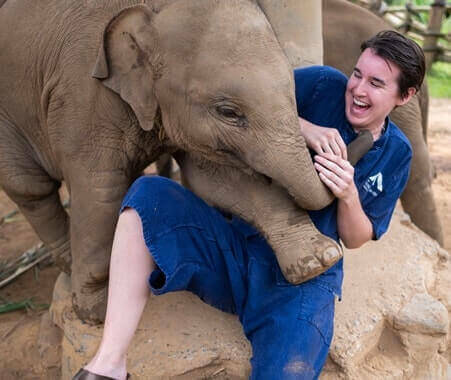 Volunteer in Thailand with Volunteering Solutions to get a wide range of volunteer abroad projects including Childcare, Teaching English, Elephant Care, Healthcare, Medical Internships, 2 Weeks Special Voluntours, Teaching Monks and more. VolSol has nearly 20 amazing and life-changing opportunities in 3 different locations in Thailand - Bangkok, Surin and Chiang Mai. For those who are looking for a perfect program where they can work and travel, the Thailand Summer Volunteer Program will surely be the best option. Travel on Weekends to Koh Tao, Krabi, Koh Phi Phi etc. There's so much to do in Thailand that you'll surely fall short of time and we advise you to make the most of your weekends! Volunteering Solutions provides amazing weekend tours for participants who wish to explore with the local coordinators. You can choose to go for a 2 Days Trip to Phuket, one of the best beach destinations as well as to Koh Phi Phi, Krabi, Koh Phangan, Koh Tao, and James Bond Island. If you are in Bangkok, take a day trip to the Floating Markets and savor the tastes of some delicious Thai Food. We also conduct trips to the Khao Yai National Park. In case you are in Chiang Mai, you can go jungle trekking and explore the Northern hilly areas where the tribals dwell. Often, volunteers also opt for weekend trips to Siem Reap (Cambodia) to see the ruins of Angkor Wat and Bayon. Go ahead and choose your weekend tour. In case you have any doubts or wish to customize your trip, simply write to us at [email protected] and we’ll help you plan your weekend! When should I apply for the volunteer programs in Chiang Mai, Thailand? As we have limited spots available in our programs and we serve on first come first basis, it is recommended that potential volunteers book their programs well in advance to get confirmed placements. You can book your slot by filling the application form online and pay the application fee of $250 You can pay your program fee later and also, in installments. However, the complete payment should be made 45 days prior to the starting date of the program. If you are volunteering in a group, you can also fill a group application form. After you complete your application, your personalized ‘My Account’ will be activated.You will need to upload your CV/Resume along with your photo in the same. Our backend team and the placement site takes around 10-12 days to review your application. After we review your CV and documents,your booking is confirmed and booking confirmation is updated in your ‘My Account’. Some projects need mandatory criminal background check and the same is mentioned in the project info of your program. Approval of your application depends on your qualification and eligibility criteria for each project. When do I need to arrive in Chiang Mai for my program? What will happen once I arrive here? Volunteers are provided with the airport pick up from the Chiang Mai International Airport by the coordinator or representative. Volunteers already in Chiang Mai will be met by the staff at a designated meeting point decided beforehand. Please note that volunteers are provided with the airport pickup from the airport between 8 AM and 8 PM only. The volunteers are advised to book their flights accordingly. Will VolSol provide discount if I choose more than one program or if I am a returning volunteer? If you are planning to come for multiple programs in your trip, you will have to pay the application fees just once. Your application fee is valid for a year's time (from the date of applying). You will not have to pay the application fees again if you come within the mentioned time frame. What is the difference between an internship and medical volunteering project? Medical internships are recommended for pre-meds, nursing and healthcare students. These internships are designed to gain experience and insight into global health and also help you gain a mature understanding of the healthcare field. Interns are placed in the various hospital departments and work under professional doctors and nurses. Medical volunteering, on the other hand, is valid for all practicing doctors and healthcare professionals. 3rd and 4th-year medical students are eligible for both the projects, i.e. medical volunteering as well as internships. This, however, is destination specific and you must consult the program advisor before booking. How much of ‘hands on’ work experience will I get from the Medical Internship? As a medical intern, you will be working under a professional doctor. 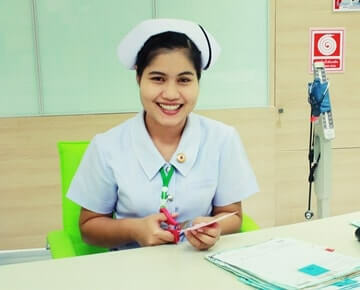 You will be assisting the doctor in various medical practices, observing the processes and would also be allowed to shadow them in critical surgeries or operations. Some pre-meds will be allowed to handle the procedures, depending on your skill set and knowledge level and confidence of the doctor on you. What are the benefits of doing an internship with VolSol? Are there any necessary requirements to participate in the internship programs? Minimum age requirement to participate in any of the programs in Chiang Mai is 18 years and above. VolSol volunteers usually work for 5 to 6 hours a day depending on their program type. You will have weekends off so you can go for traveling on weekends. However, in some projects, you will have to work on Saturdays as well. Most volunteers participating in a short-term volunteer travel experience in Thailand can enter the country on a 30 days tourist Visa which is available to a majority of nationalities on arrival at the airport itself. It is also possible to attain a 60 days tourist Visa prior to the arrival in Thailand. We can help you attain 90 days Non-Immigrant Visa as well. However, this takes longer time to apply for and requires a lot of paperwork. Please contact us for further information on the same. Please Note: During your time of volunteering, if you leave Thailand (for example: to spend a weekend in Cambodia and Laos), it will be your responsibility to re-enter Thailand and get the relevant Visa at the border. Also, note that the maximum duration of Visa at the Surin - Cambodia border is for 15 days. What are the recommended inexpensive airline options to reach Thailand? Thai Airways, Bangkok Airways, Tigerair flights, Dragonair flights, Bangkok Airways, AirAsia, Korean Air, Cathay Pacific, Singapore Airlines, Air China flights, Thai AirAsia, SilkAir. How safe is Thailand, and Chiang Mai in particular? Thailand is one of the most popular destinations in the World and attracts liable travelers all around the year. The locals are friendly and helpful as well; however, it is recommended to consult your in-country coordinators before you step out alone or go to any other locations in Chiang Mai. Also, it is recommended to be with your group whenever you venture out or stay out late in the night. It is strongly recommended to follow the safety rules and regulations provided by the in-country coordinator. Your program coordinator will take you to your program location and introduce you to everyone after giving you a basic orientation about the program/city/culture etc. You will also be told about the local transportation and how to get to your project every day from the accommodation. What sort of clothes are required for Chiang Mai? Lightweight clothing and rainwear is recommended for the day and warmer items of clothing for the evening (light jacket and/or light sweaters). A pair of walking shoes is highly recommended as well. Sandals or flip flops are comfortable options and will come in handy as well. For those traveling between November and February, please note, that the evenings can get cool, so a sweater/light jacket will come in very handy. 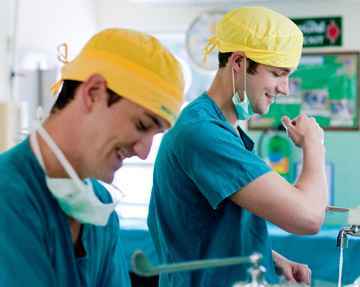 Medical Interns need to carry their scrub, lab coats and professional clothing as the program requirement. More details will be provided to enrolled participants in their pre-departure booklets. In Chiang Mai, volunteers are provided accommodation in Volunteer’s house. Located in a convenient area in the middle of Chiang Mai city, our volunteer houses are only minutes apart from each other and can accommodate up to 35 people in air-conditioned bedrooms. Both the volunteer houses have wireless internet, fully equipped kitchens as well as washing machines for volunteers’ convenience. Breakfast is self-made and volunteers are provided with all the resources to cook their own breakfast. Lunch is usually at the project site and for dinner, you can go out with other participants and enjoy the Thai cuisine in one of the many restaurants in the city. Yes – please do ensure that you inform the local team about your food preference and they can help you to try the best food available. Also, please do mention your specific food preference in the application form as well. Depending on your project, VolSol volunteers are required to put around 5-6 hours of volunteer work for 5 days a week. Evenings and Weekends are free for you to roam around and indulge in your personal work or activity. We encourage our volunteers to travel. We have designed various weekend tours which can be booked under the Add-on Tours section in your ‘My Account’. Your in-country coordinator will also help you book and organize the tours once you are in Chiang Mai. Which all places can I explore during my trip? Some of the places you can visit include Wat Chedi Luang, Chiang Mai Cabaret show, 3D art Museum, Wat Phra That Doi Suthep, Museum of World Insects and Natural Wonders, Catmosphere Cat Cafe Chiang Mai, Wattana Art Gallery, Wat Phra Singh and more. If you are planning to head out of the city on the weekends, you can go to Pai or Lampang or even head out to Bangkok for a short 2-day trip. Where can I change my money in Chiang Mai? There are ample money exchange counters at the Chiang Mai International Airport. You can change money at any bank or at the airport by showing your passport. There are ATMs located all around the city. You will not face any problems in regards to changing money while in Chiang Mai. How can I connect with past Volunteering Solutions Chiang Mai alumni as well as other former and current volunteers? We encourage volunteers to get in touch with former Volunteering Solutions participants and also other program participants joining our projects. You are recommended to join the Volunteering Solutions Facebook Page or Facebook Group to connect with other participants. When should I apply for the volunteer programs in Surin, Thailand? VolSol recommends that all interested international volunteers should apply well in advance. Our major booking seasons are from January to July and September to December. As we have limited spots available in our programs and we serve on first come first basis, it is strongly recommended to apply for the program and reserve your spot. You can book your spot in the program by filling an online form and pay the application fee. Once you complete your application, your individual 'My Account' will be active in which you will receive your placement confirmation after which you can pay the program fees. You can pay the program fees later as well in installments, but 45 days before the program starts. 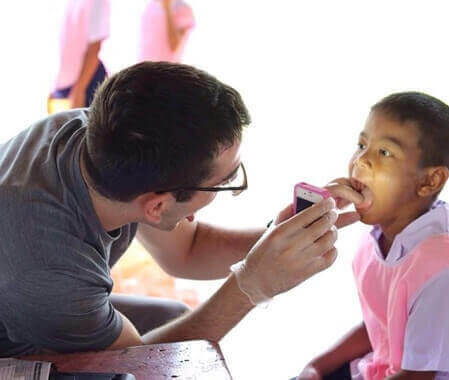 Are there any necessary requirements to participate in the Surin-based volunteer programs? 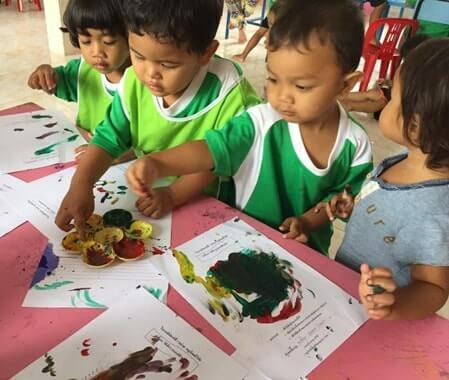 Minimum age requirement to participate in the programs in Surin is 18 years and above. The minimum age requirement for taking part in the Thailand Adventure Volunteer Program is 17 years. You will need to submit your CV/ resume along with your photo and statement of motivation. For Medical volunteers, you will need to submit a letter of recommendation as well. However, we can also accept volunteers who are seriously considering a healthcare career. In this case, however, you will only be observing and shadowing the doctors and nurses rather than directly being involved in hands-on work with patients. In our experience of more than 12+ years, we have facilitated volunteer programs for college groups, university groups, high school groups, group of families, group of couples as well as groups of colleagues. Surin is one of our popular destination among student groups and is highly recommended for family volunteering as well. When do I need to arrive in Surin for my program? What will happen once I arrive there? You have to arrive at Suvarnabhumi Airport in Bangkok (BKK) on the given arrival day which is a Friday. Our in-country coordinator will meet you at the airport and take you to your accommodation in Bangkok. Please note: We offer the airport pickup service between 06:00 AM to 10:00 PM only. Volunteers who are already in Bangkok can come directly to the hotel accommodation in Bangkok on the arrival day and meet the team there. You will be provided with the directions to the hotel as well. The accommodation in Bangkok is on Khao San Road (the hub of all ‘travellers’ ) and is easy to get to. The two nights stay in Bangkok is provided to all the volunteers. On Saturday, an orientation session will be conducted by the local coordinator, covering topic areas; such as safety, culture, language, places to visit, behavior, food, and other suggestion over things to do in Surin followed by the Bangkok City Tour. On Sunday, you will be transferred to Surin (by train or coach) and settle in your project accommodation. Our in-country team will accompany you to Surin. Each day during your program in Surin, our in-country coordinator and team will take you to your placement and back to your accommodation. Yes, you will get ample time to do so! Projects in Surin run from Monday – Thursday, giving you Friday – Sunday each week to relax and/or explore. 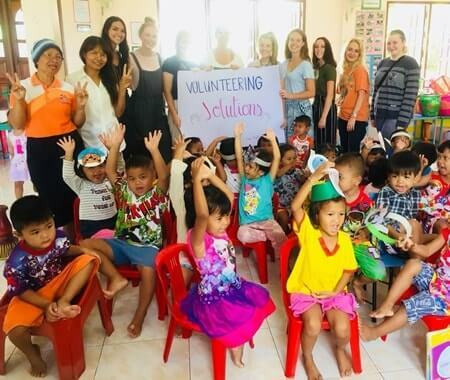 While many volunteers enjoy relaxing in Surin and explore the town, others enjoy weekend trips to Khao Yao (a stunning National Park with great trekking around 3 hours away), even longer trips to Koh Samet – an island off the East coast – or even a weekend in Cambodia. We encourage our volunteers to travel. We have designed various weekend tours which can be booked under the Add-on Tours section in your ‘My Account’. Your in-country coordinator will also help you book and organize the tours once you are in Thailand. VolSol volunteers usually work for 5 to 6 hours in a day depending on the program. Medical / Health, Teaching and Childcare programs usually run from around 8:00 AM to 2:30 / 3:00 PM from Monday to Thursday. 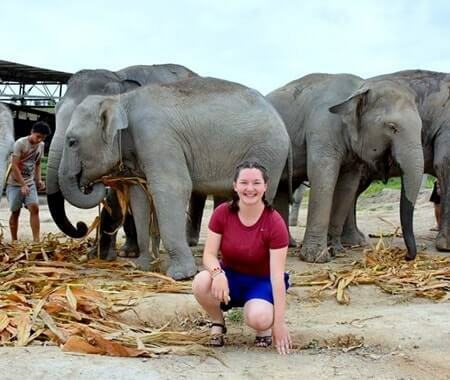 For those in the elephant program, you will spend 3.5 days a week in the village. Although, the local festivals can change these timings. 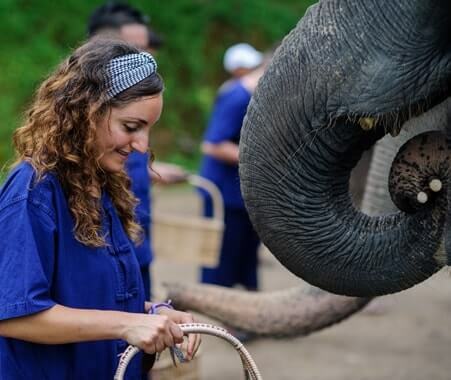 Most volunteers participating in a short-term volunteer travel experience in Thailand can enter the country with a 30 days tourist Visa which is available to the majority of nationalities on arrival at the airport itself. It is also possible to attain a 60 days tourist visa prior to the arrival in Thailand. We can help you attain 90 days Non-Immigrant Visa as well. However, this takes a longer time to apply for and requires a lot of paperwork. Please contact us for further information on the same. Also, note that the maximum duration of visa at the Surin - Cambodia border is 15 days. How safe is Thailand, and Surin in particular? You safety is of prime importance to us. We provide our volunteers with 24x7 in-country support. Our in-country team ensures a smooth, safe, and comfortable trip for our volunteers. Surin is one of the most popular destinations in Thailand and offers the travelers a traditional South Eastern culture and hospitality. Crime rates are very low, however, it is always advised to take care late at night and not have items of high value with you. We strongly recommend all the volunteers to follow the safety rules and guidelines provided by the in-country coordinator. Surin is a very healthy place to visit. You can expect the odd upset stomach as you will take time to get used to different food but, other than that, most visitors feel positively healthy and refreshed after spending time here. However, please do take precautions to cover yourself in the early evenings to avoid mosquito bites. Please visit your local doctor/travel clinic, who may recommend vaccinations prior to travel to Thailand. VolSol provides accommodation for our volunteers in the volunteer houses. The accommodation is provided on a sharing basis with around 3-5 volunteers in a room. Houses have shared bathrooms, a basic kitchen area, and a small communal living area. The house is fully equipped and is kept clean by a local housekeeper who also offers to wash clothes for a small fee. The houses are in a great location with numerous food options within less than 5 minutes walk. Wi-fi connections are not great in Surin. The system usually works well but please don’t expect to be online 24/7. Although the toilets in Thailand are of Western style, you need to pour water with a bucket as there’s no flush system to save water. 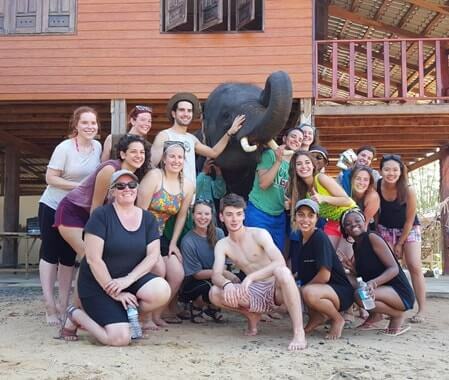 For those in the elephant project, you will stay in a homestay in the elephant village from Monday – Wednesday evening. The accommodation in the village is simple and gives you a great experience of real rural life. The home has shared rooms with fans and simple bedding (mattresses on the floor), basic cold water showers and no wifi at all. However, you’ll soon find that the experience of staying in the village far outweighs any lack of comforts. Meals are not included in the programs other than, whilst you are at the elephant village, where simple but delicious food is provided. However, half the fun of your time in Thailand is experiencing the huge range of different foods on offer and Surin is a great place to do this. From simple meat dishes with rice to complex curries and even fried insects – tuck in and enjoy ‘real’ Thai food. What sort of clothes are required for Surin? In Surin, clothing depends on the project you are taking part in. For Medical / Health, Teaching and Childcare programs, you should make sure you pack some smart/casual clothes – ie trousers, polo shirt, skirt – as a ‘smart’ appearance is important in Thailand (don’t worry – you don’t need formal office wear!). At the elephant project, you need to get old clothes – jeans/t-shirts / shorts – in which you don’t mind getting dirty / torn and an old pair of trainers/sneakers is also recommended. For your free time in Thailand, we recommend plenty of t-shirts, lightweight ‘trousers’, jeans and shorts. Please note: Thailand is a conservative country, it is recommended to be decently dressed at all times. Don’t forget ‘flip flops’ / sandals – much cooler on your feet in the evenings. For those traveling between November and February, please note that the evenings can get quite cool so a sweater/light jacket will be required. Will phone connections and internet be available? Most of our volunteers arrive with a mobile phone and for most phones, it’s easy to pick up a local SIM card to use while you are in Thailand. If your handset is ‘locked’, don’t worry – a simple handset for SMS and calls can be bought for less than $25. Internet connections can be patchy in Thailand. Although the houses do have wi-fi, this service is slow and interrupted. Please don’t expect to be online for 24/7. When you are ?in your project, you will not have access to the internet unless you use a data roaming package from home (very expensive) or buy a local package. Yes – please do ensure that you inform the local team about your food preference and they can help you to find the best food! Also, please do mention your specific food preference in the application form as well. Are there more expenses once I arrive in Surin? Your program fee covers all the necessary aspects - your accommodation, airport pick up, Orientation, placement, Pre-departure information and in-country staff support. However, you will need to cover your personal expenses, such as traveling, telephone, the internet, shopping, sightseeing etc. You should carry around $100 per week for your basic personal expenses, such as food, water, local transport, phone etc. 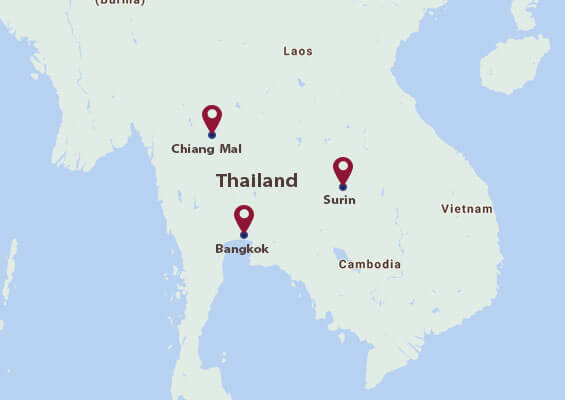 Where can I change my money in Surin? Are there ATMs in Surin? There are ATM machines in the arrival area of Bangkok Airport and you are recommended to change some money at the airport itself. Most overseas bank cards work at ATM machines in Thailand, although please do note that there is a 150THB charge for using an ATM card for international transactions. Throughout Thailand, there an ATM machines and it’s easy to withdraw money from your bank account at home. However, please note that if you are going to the elephant village you need to take cash with you for snacks, evening drinks etc. We recommend that when you travel to Thailand you bring a small amount of initial cash – to change on arrival – and then use your ATM card from home. Please note: Travelers' cheques are not recommended as they take a long time to change (you need to go to a bank during office hours, not easy when you are in your project). How can I connect with past Volunteering Solutions Surin alumni as well as other former and current volunteers? We encourage our volunteers to get in touch with former Volunteering Solutions participants and also other program participants joining our projects. You are recommended to join the Volunteering Solutions Facebook Page or Facebook Group to connect with our team and our participants. To read alumni interviews, visit ?the Meet a Volunteer section on our website. When should I apply for the volunteer programs in Bangkok, Thailand? As we have limited spots available in our programs and we serve on first come first basis, it is recommended that potential volunteers book their programs well in advance to get confirmed placements. You can book your slot by filling the application form online and pay the application fee of $250. You can pay your program fee later and also, in installments. However, the complete payment should be made 45 days prior to the starting of the program. If you are volunteering in a group, you can also fill a group application form. After you complete your application, your personalized ‘My Account’ will be activated.You will need to upload your CV/Resume along with your photo in the same. Our backend team and the placement site takes around 10-12 days to review your application. After we review your CV and documents, your booking is confirmed and updated in your ‘My Account’. Some projects need a mandatory criminal background check and the same is mentioned in the project info of your program. Approval of your application depends on your qualification and eligibility criteria for each project. 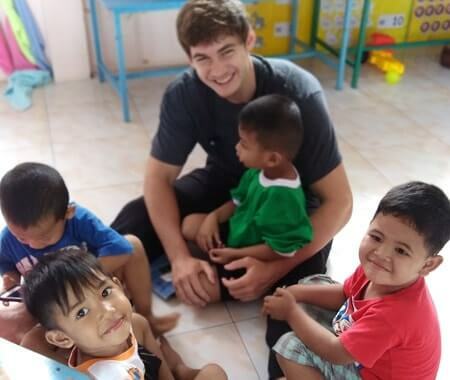 Are there any necessary requirements to participate in the Thailand-based volunteer programs? Minimum age requirement to participate in any of the programs in Bangkok is 18 years and above. Age limit is 20 years and above. Statement of motivation is required. Interns have to submit a CV/Resume. Interns are required to give a list of their preferred departments where they would like to work in the hospital. For Volunteers working at the kindergarten project, orphanage project as well as women empowerment project, mandatory criminal background check needs to be provided. When do I need to arrive in Bangkok for my program? What will happen once I arrive here? All volunteers and interns need to arrive in Bangkok on Friday. Airport pick-up is provided by us from Suvarnabhumi International Airport (BKK). Pick up timings are fixed between 8 AM to 8 PM. If you are already in Bangkok, we can arrange for a pickup from your local address/lodging/hotel. However, you will need to inform your in-country coordinator well in advance of the same. Early arrivers can check for the local services, sim cards, from the airport itself. Telco sales counter is at the arrivals area (on exiting the customs). If you are planning to come for multiple programs in your trip, you will have to pay the application fees just once. Your application fee will be valid for a year's time (from the date of application). You will not have to pay the application fees again if you come within the mentioned time frame. For how long will I volunteer every day? VolSol volunteers usually work for 5 to 6 hours a day depending on their program type. You will have weekends off to explore this bustling city. Most volunteers participating in a short-term volunteer travel experience in Thailand can enter the country on a 30 days tourist visa which is available to the majority of nationalities on arrival at the airport itself. It is also possible to attain a 60 days tourist visa prior to the arrival in Thailand. We can also help you attain 90 days Non-Immigrant Visa as well. However, this takes a longer time to apply for and requires a lot of paperwork. Please contact us for further information on the same. What are the recommended airline options to reach Thailand? How safe is Thailand, and Bangkok in particular? Thailand is one of the most popular tourist destinations in the world and attracts liable travelers all around the year. The locals are friendly and helpful as well; however, it is recommended to consult your in-country coordinators before you step out alone or go to any other location in Bangkok. Also, we would recommend you to be with your group whenever you venture out or stay out late in the night. Yes, it is mandatory to have a travel medical insurance while traveling. To provide the best option to our participants, we offer comprehensive insurance coverage at a nominal price, in collaboration with a leading insurance provider. If you already have an insurance, you do not need to buy it from us. However, it is recommended to carry your insurance documents with you while you are traveling. Our in-country coordinator will meet you at the airport for the transfers. The program coordinator will take you to your accommodation and introduce you to our team and other volunteers.A basic orientation about the program, city, culture is provided. You are also briefed about the local transportation and directions to your project every day from the accommodation. What sorts of clothes are required for Bangkok? Lightweight clothing and rainwear is recommended for the day and warmer clothing for the evening (light jacket and/or light sweaters). A pair of walking shoes is highly recommended as well. Sandals or flip flops are a comfortable option and will come in handy as well. For those traveling between November and February, please note, that the evenings can get cool, so a sweater/light jacket will be required. 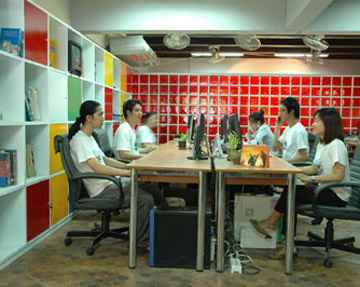 Volunteers are provided accommodation in the volunteer’s house in Bangkok. The accommodation is shared on the same gender basis. The house is well furnished and equipped with all the modern facilities. All rooms are air conditioned and the house is wifi enabled. The house has a good road connectivity via BTS Skytrain system. A ride to Sky Train station would cost you around 20 Thai Bahts (80 US cents). Breakfast is to be prepared by the participants on their own. The cooking supplies will be provided to the volunteers in the house. Lunch is usually provided at the project site and for dinner, you can go out with other participants and enjoy the Thai cuisine at any of the restaurants in the bustling city. Depending on your project, VolSol volunteers are required to put around 5-6 hours of volunteering work for 5 days in a week. Evenings and weekends are free for you to explore in and around the city. We encourage our volunteers to travel. We have designed various weekend tours which can be booked under the ‘Add-on Tours’ section in your ‘My Account’. The in-country coordinator will also help you book and organize the tours once you reach Thailand. What all can I explore during my volunteer trip? There are unlimited opportunities in Bangkok to explore. There are several temples (known as Wat) – Wat Arun, Wat Saket, Suthat and more. Wildlife enthusiasts can also go to Safari World, Bangkok National Museum, Crocodile zoo, Memorial Parks and a lot more. A walking tour of the city is recommended as it allows you to explore the Thai culture in a fantastic manner. Also, you can explore the popular floating markets of Bangkok and savor the tastes of the delicious local food that’s available there. Are there more expenses once I arrive in Bangkok? Your program fee covers your accommodation, airport pick-up, orientation, pre-departure booklet and 24x7 in country staff support. You will need to cover your personal expenses, such as traveling, telephone, the internet, shopping, sightseeing, return airport drop, weekend tours etc. However, you should carry around $50 - $60 per week for your basic personal expenses, such as water, local transport, phone etc. Where can I change my money in Bangkok? Are there ATMs in Bangkok? There are several money exchange counters at the airport with almost the same exchange rates being offered at each counter. Your best bet is Thai Military Bank (TMB), Siam Commercial Bank (SCB) and Kasikorn Bank. You can get currency exchanged from local shops in Thailand as well; however, keep a tab on official rates. How can I connect with past Volunteering Solutions Bangkok alumni as well as other former and current volunteers? To read alumni interviews, visit the Meet a Volunteer section on our website.